Gulberg Islamabad is a project of IB Employees Cooperative Housing Society (IBECHS) Islamabad. It is ideally located between the twin cities of Islamabad and Rawalpindi at Islamabad Main Expressway which is 3 km from BB International Airport Islamabad and 12.5 km from Zero points Islamabad. The housing scheme consists of two projects i.e. 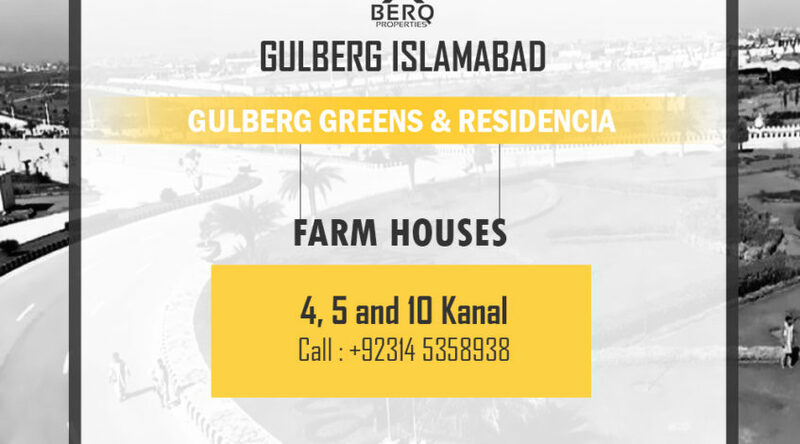 Gulberg Greens (Agro Farm Housing Scheme) and Gulberg Residencia. Let’s get into details of these two projects. Gulberg Greens is all about living in luxury of planned greens & wooded parks with innovative town planning where everything is located at walking distance. The area consists of thousands of Kanals of rich greens land. It is divided in 6 blocks, i.e. Executive A, B, C, D and E blocks. Gulberg has completed development of blocks A,B and C where possessions have been announced. Block D & E are currently under development where hundreds of labor & machinery are actively working towards the speedy development of the project. A project of the commercial plaza has also launched recently by the name of Gulberg Trade Center in block B of Gulberg Greens where booking of shops & apartments is going on. Commercial plots of 40×40 sizes are launched in B block, where a small commercial area is developed close to the entrance to the right side after crossing first bridge. Prices of these commercials are very high, i.e. above 3.50 crore which is payable in 4 equal installments. However, the location is quite appealing and it can be one of the most expensive commercial area of this society in the years to come. Gulberg Residencia is one of the most happening housing societies in Islamabad. This is due to the fact that development work is ongoing in various blocks. While the developer is in the process to clear the litigated land, it also has a backup plan to adjust the plot owners in new blocks. Moreover, the launch of a new map is expected soon. The final map by the developer is currently with the Capital Development Authority for approval. If you’ve already invested in Gulberg Residencia or looking to invest here, here’s an update on the status of each block. The developer has recently announced possession of 250 plots (2-kanal) here. Development work has been completed by 90%. The developer doesn’t have possession of the remaining 10% area of the block. It is highly likely that these plot owners will be adjusted in some other block. Development work on 120 plots measuring 1 kanal in this block has been completed. However, possession for these is yet to be announced. Work on the remaining 90% area of Block B is yet to begin. Land here is clear of any litigation issues. It is expected that as soon as related machinery engaged in other blocks is available, development work will start. Development work in this block has been completed by 90%. In addition, the possession has also been granted. The remaining 10% of land has recently been cleared of litigation. The developer is yet to resume completing the development of this block. This block is the society’s commercial center. The developer held an auction of around 100 plots this year, while 45% of these plots are yet to be offered on auction. Development work has been completed. The popularity of these plots can be gauged from the fact the auctioned plots are hardly ever available in the resale market. Currently, construction of two buildings featuring ground plus three floors is ongoing. It is among the few Gulberg Residencia blocks where development work has been completed and possession is available throughout. Block E is popular among the end users looking to construct their homes soon. However, the demand, in comparison with other blocks, is relatively low as bigger plots have fewer buyers. Development work here has been fully completed, while possession has also been granted to the respective owners. The block is popular among genuine buyers eyeing smaller plots; that’s also the reason why as many as 12 houses are under construction here. For some reasons, the developer hasn’t started to resume construction work on the 80% of the land awaiting it. The land was recently freed from the local settlers. There is no news on how soon development focus will shift to this block, explaining comparatively lower property rates. The rates have nonetheless increased since October this year. Block H’s 40% land is in litigation and it is expected that the developer will adjust these plots in some other block. The details on this will be revealed once the final map gets CDA approval. In the meantime, possession for all 10-marla plots here has been granted, while work on a few lanes featuring 7-marla plot is in its final stages. The block is popular among the end users looking for plots in a smaller size because development work has been completed by 100% and possession has also been granted. Currently, the block is home to only a couple of families, but construction work is underway on 50 units. Furthermore, the location of Block I is also considered prime. Development work has been completed by 60%. The possession for developed plots has also been granted. At the moment, construction of five houses is underway. Meanwhile, there is no update on how soon development work in the remaining part can be resumed. Development work here is yet to begin but the good news is that a deal between the developer and landowners has been finalized. The settlers will be moved soon, allowing the developer to kick off development work. The final decision about how soon the development work will start rests with the developer. Development work in Block L has been completed by 90%, while possession for the developed plots has also been granted. On the remaining 10%, work to level the ground is underway. The block is home to only one family, while the construction of six units is ongoing. The block is free from litigation and that’s despite the fact that development work here has been completed on 30% of the area. The developer recently announced possession for 100 plots measuring 7 marlas. Since the developer has other blocks on its priority list for completing development work, similar activity here isn’t expected right away. The developer has recently got hold of the land from landowners and development work is currently on hold. The previously developed 5% of the total area is all that has been done so far. Moreover, no information is available on how soon should we expect the machinery to be moved to Block N.
The block features approximately 1,200 plots, and possession has been granted for only 100. The main reason why development work couldn’t be carried out in Block O is that land here is in litigation. These plots will be readjusted in some other block. Only 5% of Block P is litigation, while work on the remaining land is underway. The machinery is currently busy leveling the terrain and cutting the plots. It is among the most happening blocks as prices here are low due to its location towards the edge of the society. However, the block is on height and thus considered good by some. It is one of the blocks where development work is currently underway and since only 40% of it has been developed so far, property demand for these plots is lukewarm. The pace of ongoing work is impressive. Another good thing is that Block Q has no land in litigation. The block is completed by 80% and the possession for these plots is also available. Work on the remaining 20% of the land is on hold as the land is in litigation; it is much likely that the situation will settle in favor of the society. As and when possession of land is retrieved, development work will kick start. Block S has been developed over 30% and possession for the developed plots is also available. This block features 1-kanal plots alone so transaction volume is comparatively low. The block is clear from all litigation, so the ongoing development work should complete as per the schedule. Development work has been completed by 90%, with possession available. The entire block is free from litigation issues. In addition, it is likely that as soon as work in Block S completes, machinery will be moved to this block. Due to this reason, the demand for plots in Block T is gradually increasing. Block V is 10% in litigation, while development work here has been completed by 70%. The good part is that work is ongoing on the land cleared from litigation. The owners of plots in litigated parts will be adjusted in some other block. The expected new block will have a prime location, so there is nothing to worry about.